Braces are one of the most effective ways to achieve a straighter and more beautiful smile, but did you know their benefits go beyond just aesthetics? Straighter teeth help to create a healthier mouth, as they are easier to brush and floss. Additionally, straightening your smile can help you to chew, bite, and speak more effectively, resulting in optimal oral health that benefits your lifestyle too. At Green Apple Dental Clinic, we’re passionate about helping every patient achieve the smile they’ve always dreamed of, which is why we offer a wide range of braces to suit your individual needs. If you’re interested in getting braces, but don’t know where to start, be assured that we’re here to help you through every stage. During your initial consultation, our friendly team will be more than happy to assist you in selecting the perfect type of braces for your mouth, aesthetic preference, and budget. Conventional metal braces are our more popular choice of braces, particularly among our teenage patients. Not only are they extremely effective at creating a straighter, more confident smile, but they’re also one of the more affordable orthodontic options. Not to be confused with the unsightly metal braces of decades past, our conventional braces are now a lot lighter and minimalistic in structure. For this treatment, we use a type of dental cement to attach stainless steel brackets to the patient’s teeth. These are then linked together with a thin wire to gently guide the teeth into a straighter, more pleasing position. O-rings or ligatures are used to connect this wire to each tooth bracket, and you’ll find that these look like tiny rubber elastics. These elastics are available in a variety of colours, with patients being able to select new ones each month. 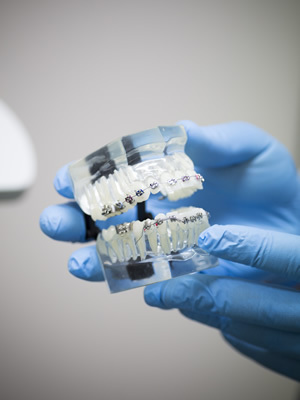 Ceramic braces aren’t too different to conventional braces, but the major difference is that the brackets are made from a transparent ceramic material (as opposed to metal). This makes them the perfect solution for those wanting a more discreet teeth-straightening treatment, despite their increased cost. Don’t let a crooked smile hold you back any longer. Achieve the straighter, more confident smile of your dreams with Green Apple Dental Clinic today! Contact us on (03) 9077 3807 to schedule a consultation with our friendly dentists.